SCVHistory.com AP0925 | Newhall | Film Shoot at First Presbyterian Church, ~1920. Film shoot at the First Presbyterian Church on Newhall Avenue, late 1910s or early 1920s. This church building was erected in 1891 and replaced in 1923 with a brick structure. Tom Mix was shooting regularly in the Newhall area in the late 1910s and early 1920s. He put up his crew in a row of bungalows on Walnut Street. Chaplin also used the front of the building in 1923's "The Pilgrim" as seen here. The First Presbyterian Church in Newhall was an outgrowth of the Sunday School classes that were held during the late 1870s and 1880s in the lounge of the Southern Hotel, on the second floor of the Newhall School, and in parishioners' homes. 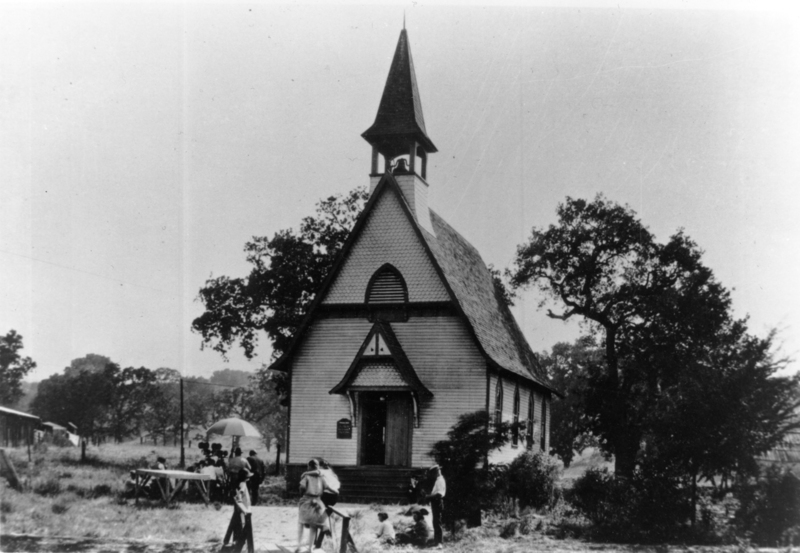 The original wooden chapel opened for business May 31, 1891, at Market Street and Newhall Avenue, on land donated by Margaret Jane (White) Newhall (Jan. 16, 1831 - Nov. 3, 1900), widow of Henry Mayo Newhall, who had died in 1882. The Newhall family donated about two-thirds of the construction costs. In 1923, the wooden chapel was moved a couple of hundred feet toward Eighth Street and transformed into a two-story brick structure that was severely damaged in the Sylmar Earthquake of Feb. 9, 1971. The brick building continued to be used for church classes and meetings until a new church building was completed in 1977. AP0925: 9600 dpi jpeg from copy print.